The old kitchen and another building and kiln are gone but there is still one kiln left. When you walk along the creek, you can still see where the brick was loaded for shipping. The way the subdivision is laid out most neighborhoods within Brickyard have entrances off the main parkway. 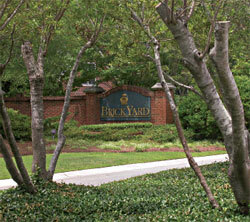 Many families are on their second or third home in Brickyard because they like the area so much. Some move up to larger homes and others are downsizing. There is something for everyone.